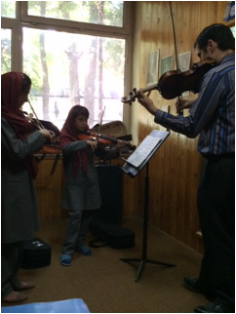 Two members of Cuatro Puntos are being sent by the United States Embassy to teach at the Afghanistan National Institute of Music in Kabul for 4 weeks in 2014. The Afghanistan National Institute of Music was founded in 2009 to help rebuild the musical culture of the country after many years where all types of music were entirely banned under an oppressive regime. The school primarily educates street kids- those who previously sold items on the streets to support their families. These students are given the opportunity to receive a rounded education, centered in music. The musicians of Cuatro Puntos are honored to have been selected to be a part of this important work rebuilding a war-torn country through music. Cuatro Puntos has commissioned United Kingdom- based composer Sadie Harrison to write a piece of music for viola and rubab to be premiered at a concert in Kabul, Afghanistan. This piece will represent the peaceful and equal co-existence of our two cultures. The juxtaposition of the viola, a uniquely western instrument, with the rubab, the national instrument of Afghanistan, represents the ideal of how both cultures can mingle and interact in constructive ways, while still maintaining their uniqueness. This piece will be premiered in Kabul by American violist Kevin Bishop and a young rubab student from the Afghanistan National Institute of Music. The piece will be published by the University of New York Press. Click here for more information.